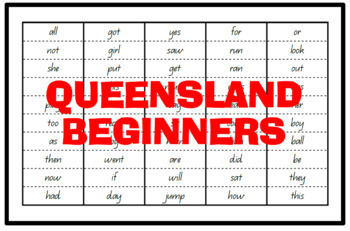 Are you searching for a set of Quick Cards for "First 50 High Frequency Words" in a Queensland Beginners font theme? Then look no further! This set comes as an Australian A4 sized PDF, ready to just print, laminate and cut-out. It's a black and white set, to keep it plain and simple and to cut down on excessive printing costs by having no colour at all. Once each page has been laminated and each word card has been cut-out, simply use a hole puncher to insert a hole in either the top-left or top-right hand corner of each card and slip a ring fastener into it. This creates a lovely little set all held together on a ring, making it easy to keep it all together and to flip through each card. Why not use a whiteboard marker to put a little tick on each card once a student is able to recognise and read each word? Or perhaps stick a star sticker on each one as it's achieved. As you flip through the words, students will quickly see a tick or a sticker and immediately know they've already conquered this word. They'll be proud to say the word confidently and quickly, and can then move onto the next words they haven't quite grasped yet. This set comes with a list of each of the 50 High Frequency Words in a card size format, which has been included to place on the ring with the rest of the set (a quick reference). You can insert the words on the ring in the order they have been listed in the PDF, or in any order you choose. Each card measures 9cm (W) x 5.85cm (H). Once the full set is printed (7 x A4 pages in total), you will end up with a total of 52 cards. 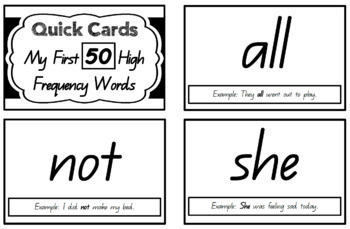 Each word on each card has an example sentence using the word in context. 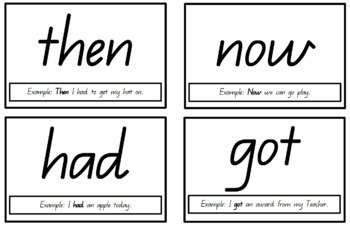 Whilst students may not be ready to read the sentence by themselves, a Teacher, a Teachers Aide, parent or anyone helping them could read the sentence aloud to them until they are ready to try themselves. Imagine how proud they'll feel of themselves if they can recall the sentence from earlier attempts at their Quick Cards words! Looking for this set but in an alternative font and/or alternative size format? Keep an eye out on my listings, as these will be listed very shortly! 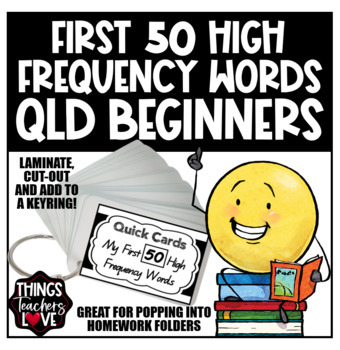 Quick Cards; quick cards; quick; card; Kindy; kindy; Prep; prep; Year One; high frequency words; frequency; words; learn to read; word recognition; student; students; ready to laminate; homework ideas; words practice; Australia; Aussie; Down Under; Love My Printables.